The Yankees announced on Wednesday that they have signed three additional international prospects: Cuba natives 16-year-old right-handed pitcher Osiel Rodriguez and 16-year-old shortstop Alexander Vargas; and Jose Chambuco, a 16-year-old right-handed pitcher from Carora, Venezuela. 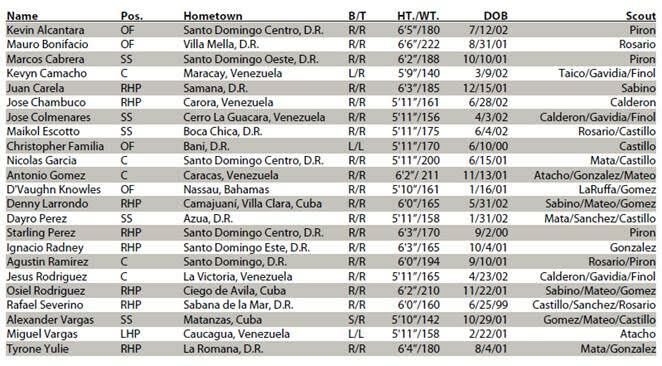 The Yankees have signed 23 international prospects overall. Rodriguez was named by Baseball America as the No. 5 international prospect, the top ranked pitcher by the publication. He was also tabbed as the No. 7 international prospect by FanGraphs and No. 10 by MLB.com. Vargas is listed as the No. 8 international prospect by MLB.com and No. 14 by FanGraphs. According to FanGraphs, the Yankees have signed four of the top-15 prospects (also No. 4 Kevin Alcantara and No. 15 Antonio Gomez). Thanks for sharing the post.This is one wonderful blog article.Much thanks again.They contain pieces of advice. I am trustworthy identical best work from you when you need it at the same time.